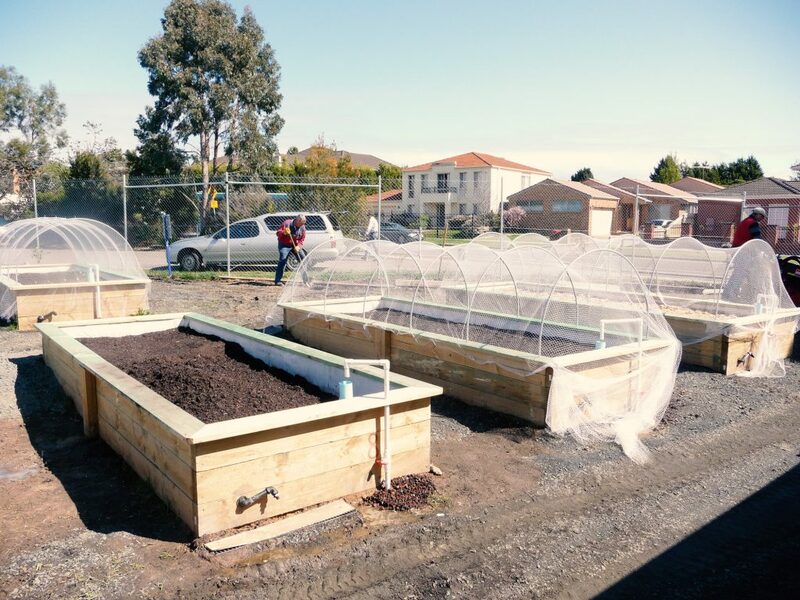 Around September 2014 the Manager of Endeavour Ministries Inc approached Gleneagles Secondary College with an idea to create a community garden in the Endeavour Hills area. Her reasons for wanting to establish such a garden were related to the needs she saw for doing something to address major issues for many disadvantaged families – social isolation and depression related to unemployment. It was envisaged that the garden would provide an opportunity for people to engage with others whilst doing something both satisfying and productive. It would also involve an activity where people could learn from others and share their own knowledge to help others with less knowledge of gardening. The garden would also provide many who might be retired but have gardening expertise, the opportunity to share their knowledge and experience. The students from the school could also benefit from the garden both educationally and as a means of giving back to the community by growing vegetables in a couple of the beds to be used at the Andrews Centre meals program. With all this in mind, Judy approached Gleneagles Secondary College who were more than eager to adopt the project in partnership with The Andrews Centre – and so the work began! Financial support was sought and initially gained from the Andrews Foundation and R E Ross Trust. 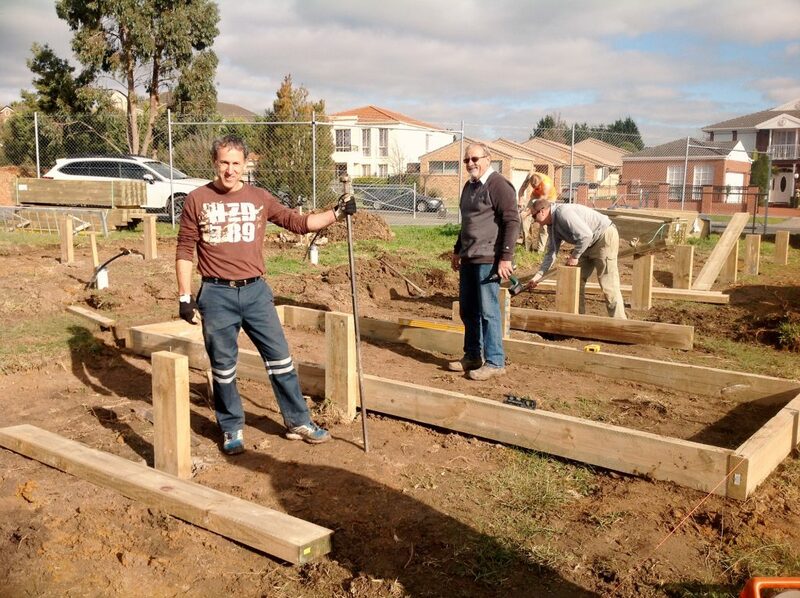 Subsequently further financial support was provided by Endeavour Hills Rotary, E C White Trust and City of Casey. Bunnings Dandenong provided us with plants and a BBQ and Melbourne Firebricks provided us with a beautiful pizza oven. Thanks to the support of men from different trades giving their time and expertise, the garden shed was erected and the area at the bottom of the school grounds was cleared and fenced off. Karl Lapinskas, Engineer, designed the garden site and structures. Then began the work of levelling the area and building each of 16 wicking beds, each with its own plumbing and taps so that watering was kept to a minimum and plants were watered from underneath. 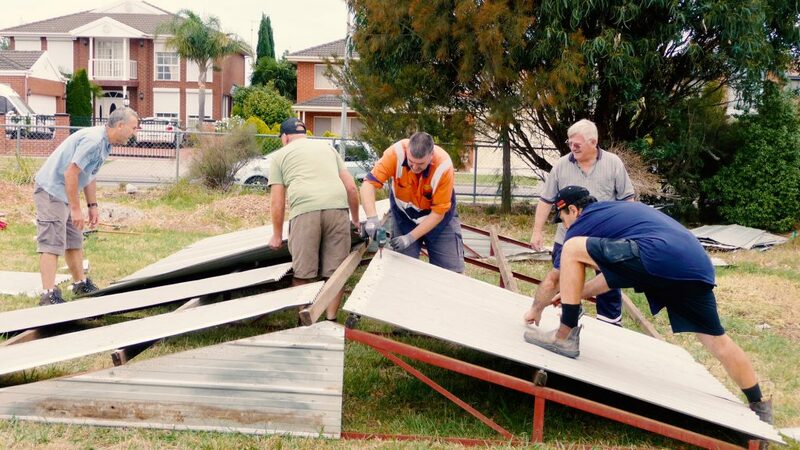 Many folk helped out, including Endeavour Hills Rotary, Maranatha Christian School students, and a number of willing skilled helpers from a number of different churches and from the Andrews Centre. By September the gardens were all built and ready for planting. 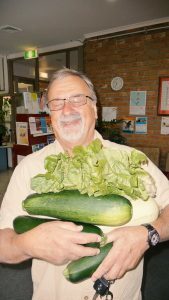 John Majkut agreed to be our Garden Manager and most of the garden plots have already been allocated to interested parties. The first crop of vegetables has now been harvested to the delight of all involved! Thanks to the generosity of Mr Geoff Brooke, we also have apple trees espaliated all along the fenceline and the garden community were all shown how to graft the fruit the onto root crop. On Australia Day a community of garden enthusiasts and their friends gathered at the garden to initiate the pizza oven. For information on how to hire a wicking bed and/or join our community garden team, please ring the andrews centre on 9700 4944 or contact us.